If you’re an MTC Little River local phone customer, you have an easy way to manage your Voice Mail service online. Just click on the “Manage your phone features and voice mail” button at the top of the home page, then put in your ten-digit telephone number and your password, you can start managing all your phone services, including Voice Mail, online. It’s easy and fun! TIP: Send us an e-mail or give us a call and we’ll set you up a password so you can get started! You can see right on the main screen if you have any Voice Mail messages. If you do, you can click the link, listen to them right on your computer, and even save them as a WAV file! But this is just the beginning. If you click on the “Call Manager” tab (see below), you’ll see that you can even set your phone to send your calls directly to Voice Mail if you’re busy or don’t want to be bothered by a ringing phone. As you can see from the screen shot , you can even set your phone to send your calls to another phone (like your cell phone) so you can take them with you when you leave the house if you have MTC’s Call Forwarding feature. Important tip: Whenever you choose an action, make sure you hit the “Apply” button at the bottom or the change won’t be made! Finally, you can easily set how long you want your phone to ring before it goes to Voice Mail. Have a hard time getting to the phone? Set it for 45 seconds. 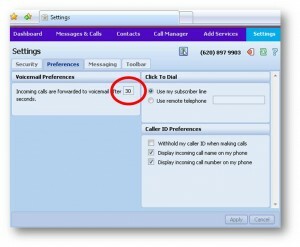 Don’t want people to wait long before going to Voice Mail? Set it for 15 seconds! 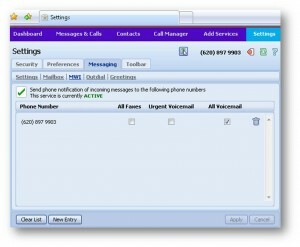 You can also send notification to other phone numbers letting you know that you have a Voice Mail message. For example, say you don’t want to forward all your calls to your cell phone because you don’t want to be bothered, but you do want to know if you get any important messages. Just send notification to your cell phone when you get a Voice Mail message! 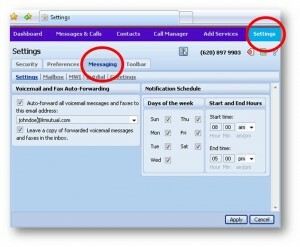 Managing your Voice Mail online is easy, FREE, and can revolutionize the way you use your phone! If you have any questions, please give us a call. 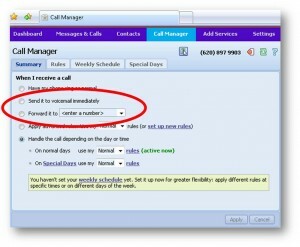 Otherwise, we encourage you to access the call management portal and play around with the various features it offers!